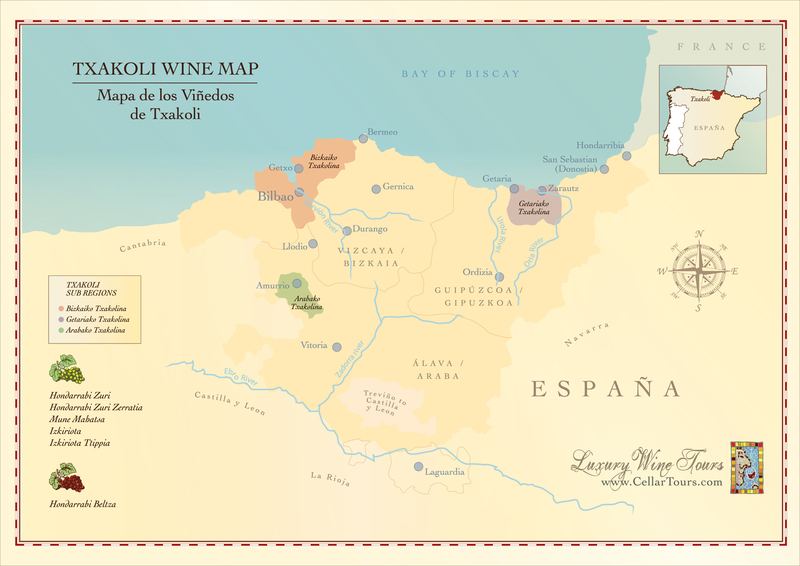 The Txakoli wine region is in the beautiful Basque Country in the North of Spain. País Vasco or Euskadi as its known locally is renowned for its innovative gastronomy and striking landscapes, yet not so well known internationally, at least for its light, fruity and acid-driven, slightly sparkling white wine, Txakoli (pronounced cha-ko-lee). Txakoli dates back hundreds of years with a fierce tradition regarding production from indigenous grape varieties; Hondarrabi Zuri, Hondarrabi Zuri Zerratia, and Izkiriota. It is however only fairly recently that the region gained D.O. status, the first being D.O. Txakoli Getaria (or Getariako Txakolina) in 1989 thanks to local viticulturists getting together to make it happen. Txakoli Getaria is a coastal region situated between Getaria and San Sebastian and is the largest of the 3 sub-regions in terms of production. Txakoli Bizkaia (Bizkailo Txakolina) is located further north-west, also on the coast and the wines from here are known to be typically more minerally and slightly more acidic. The third and smallest of the sub-regions Txakoli Álava (Arabako Txakolina) is inland, south of Bilbao in the Ayala Valley, approaching the Rioja Alavesa sub-region. You can discover these unique, zippy wines as part of our Basque Food and Wine Tour. Embed Txakoli Wine Region Map on your site: copy and paste the code below.